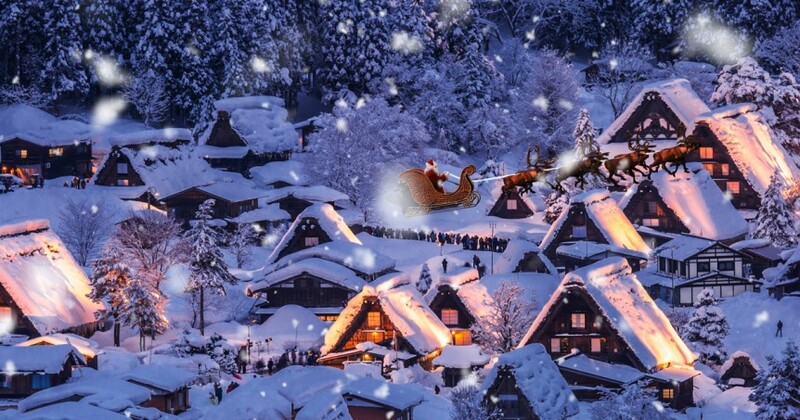 Santa Claus flies through the Shirakawa village located in beautiful Japan. Shirakawa is best known for being the site of Shirakawa-gō, a small, traditional village that still has buildings known as gasshō-zukuri. These beautiful buildings are home to many good boys and girls so Santa flies in no matter what the weather is. Shirakawa-gō is beautiful in every season and as you can see from our photo winter is quite impressive. Still the most popular time of year for tourists is in Fall during the Autumn colors.